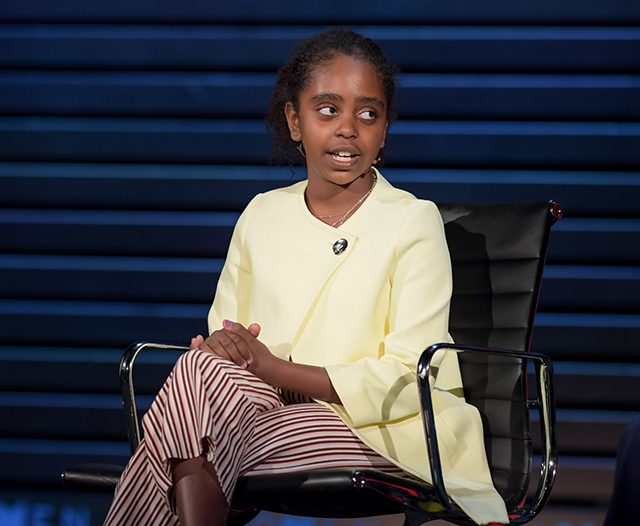 Women’s Summit Also Spotlights Girls | Kid Reporters' Notebook | Scholastic Inc.
At the 2018 Women in the World Summit, 11-year-old Naomi Wadler spoke about negative portrayals of African American women and girls in the media. People from across the globe traveled to New York City for the 2018 Women in the World Summit. The three-day event, which began on April 12 at Lincoln Center, featured a range of speakers, including Academy Award-winning actress Viola Davis, Canadian author Margaret Atwood, and Misty Copeland, a principal dancer for the American Ballet Theatre. The annual gathering, which is now in its ninth year, highlights the challenges and achievements of women everywhere. “Women in the World has been a voice for those who will not be silenced by censorship, patriarchy, injustice, and stifling norms,” said host Tina Brown, founder and chief executive officer of Life Media/Women in the World. The speakers discussed some of the issues that have shaped the news this year, including gun violence, racial injustice, and the global refugee crisis. Madeleine Habib, who captains a vessel for Médecins Sans Frontières (Doctors Without Borders), talked about her experiences rescuing refugees from the Mediterranean Sea. Suzanne Barakat, a family physician in San Francisco who is Muslim, spoke about countering Islamophobia. After her brother, his wife, and his sister-in-law were killed in a hate crime in North Carolina, Barakat started a foundation called Our Three Winners. It carries on the legacy of the victims by funding humanitarian and public service projects. Young activists talk about how they are addressing such issues as gun violence and inequality in a discussion moderated by Athena Jones, a national correspondent for CNN. Student activist Emma González of Parkland, Florida, is on the screen behind them. One of the summit’s most powerful discussions gave young people a forum to discuss their efforts to stem violence and inequality. Naomi gained national prominence last month when she spoke at the March for Our Lives, an anti-gun violence rally in Washington, D.C.
At the summit, panelist Delaney Tarr, 17, talked about she and her fellow students are leading a national campaign for stricter gun-control laws. Delaney is a senior at Marjory Stoneman Douglas High School in Parkland, Florida, where 17 people were killed in a mass shooting in February. Delaney Tarr, a student survivor of the Parkland, Florida, shootings, participated in the “Youthquake” panel at the women’s summit in New York City.